MatrixCast Streaming Technology - MatrixStream Technologies, Inc. The idea of delivering High Definition (HD) or Ultra 4K videos over the Internet has been around for quite some time. In the past, it was hard to imagine the possibility due to the fact that broadband Internet was not widely available and that HD videos require a huge amount of bandwidth. Today, growth of broadband connections worldwide is reaching to a pace that’s even faster than the growth of mobile phones at similar stage. With the availability of faster IP connections, it is not hard to imagine that someday it will be possible to deliver high quality videos over the Internet or any broadband connections. MatrixCast is the streaming protocol that allows IPTV operators the ability to stream over the Internet without QoS and at a low bitrate. Interactivity such as communication, voting, interactive advertising, and TV e-commerce. Unlimited channel capacity – cable and satellite services have limited channel capacity. Since IPTV is based on a switch network, there is no limit on how many high-definition channels that can be delivered to the user. Integration across multiple platforms with services such as voice, data and user content (including video, voice, music, and gaming). Personalization including individualized advertising and smart TV/video program recommendations. Additional services include access to millions of Videos On Demand (VOD) programs and Digital Video Recordings (DVRs). Value-added services including access to on-demand gaming, music, photos, media applications, home networking management, security, and data management. While IPTV is definitely the future, there are number of issues that must be resolved for massive adoption. Many IPTV solutions not designed for the Internet without QoS – Many IPTV solutions today are based on legacy MPEG-2 or Windows Media video codec. MPEG 2-TS is designed to stream over multicast network only so you cannot stream it over the Internet. Windows Media ASF has very poor streaming capability over the Internet. Usually, you can only stream low resolution 320X240 300kbps streams with a lot of buffering ranging from 5 to 30 seconds or more. Limited Bandwidth available over DSL network – High Definition videos encoded in MPEG-2 and streaming with MPEG-2 TS would require a minimal of 20 Mbps of bandwidth. Most DSL Internet connections do not have that kind of bandwidth from server to client and have distance limitations. Usually ADSL 2+ gives an average of 6 mbps so it is impossible to deliver HD over ADSL without using technology such as MatrixStream MatrixCast streaming. Existing IPTV Solutions are Not Firewall Friendly – Most existing IPTV solutions are designed to work in a closed or private IPTV network. Most IPTV solutions are not designed to work over the Internet or through multiple routers and firewalls. Poor User Experience – In order for IPTV solutions to compete with existing digital cable and satellite solutions, the user experience must meet or exceed the digital cable and satellite systems. Many existing IPTV solutions have multiple issues that can cause a poor user experience. For example, many IPTV solutions have long latency when it comes to change one TV channel to another. Some of the IPTV solutions might not be responsive when loading an EPG (Electronic Programming Guide) on the IP STB (Set Top Box). Many VOD videos on some IPTV solutions might take a long time to start and play. Lack of True End-to-End Solution – In order to build an IPTV solution, most IPTV providers have to go with a multi-vendor solution due to lack of complete end-to-end solution on the market. This is not only expensive but also time consuming. 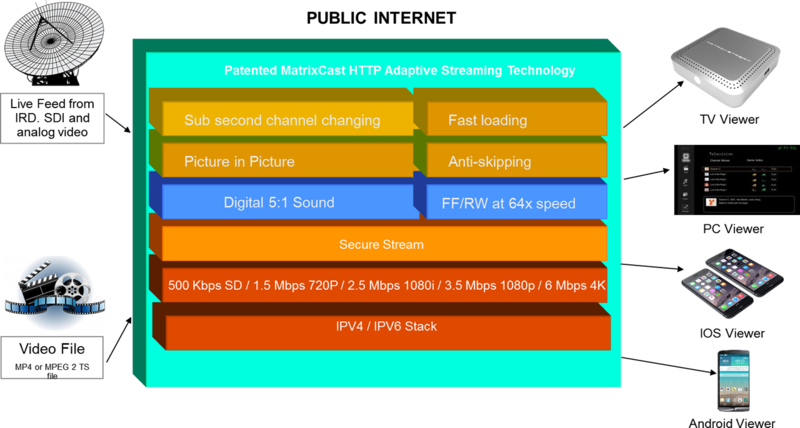 The patented MatrixCast streaming system is designed to deliver highest quality HD video over any broadband connection, including the Internet. At the same time, it can deliver the ultimate IPTV end-user experience similar to what users are used to with their existing cable and satellite TV subscriptions. Supports High Definition HD streaming 720p videos at 1.5 Mbps or DVD quality videos at 750 kbps using H.264 / HEVC compression. Allows IPTV viewers to change TV channels under 1 sec. IPTV or VOD videos will start playing instantly when a viewer selects to play. Supports full True 5.1 and 7.1 Digital surround sound with IPTV videos. Built-in CA (Conditional Access) and streaming encryption using MatrixCast-TS (MatrixStream Transport Stream). Video streaming security can be upgraded dynamically at any time via built-in remote upgrade features. DVD-like features with fast forward and rewind streaming videos at 64 different speeds. Supports for both PC, MAC, Android smart phones, Android tablets, Apple iPhone, Apple iPad, and IP STB (Set Top Box) video viewing clients. With a MatrixCast IPTV solution, viewers can get a superior viewing experience when compared to existing digital satellite and cable systems. In addition, IPTV with MatrixCast allows any IPTV operator to deliver unlimited TV channels and unlimited VOD (Video On Demand) videos. Ultimately, any IPTV viewer will have the choice to watch high quality videos at any time that’s convenient to him or her.